Ba chóir an t-alt seo a ghlanadh, mar: Gramadach! Róghearr! 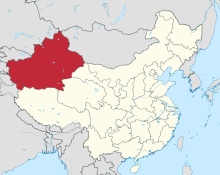 Cúige agus Réigiún Féinrialaitheach is ea Xinjiang (Sínis: 新疆维吾尔自治区, Pinyin: Xīnjiāng Wéiwú'ěr Zìzhìqū, "Réigiún Uigiúrach Féinrialaitheach Xinjiang") i nDaon-Phoblacht na Síne. Tá an cúige suite in iárthuaisceart na tíre. Is é Ürümqi príomhchathair Xinjiang. Ciallaíonn Xinjiang "Teorainn Nua". Tugadh an leathanach seo cothrom le dáta an 4 Meitheamh 2016 ag 19:09.